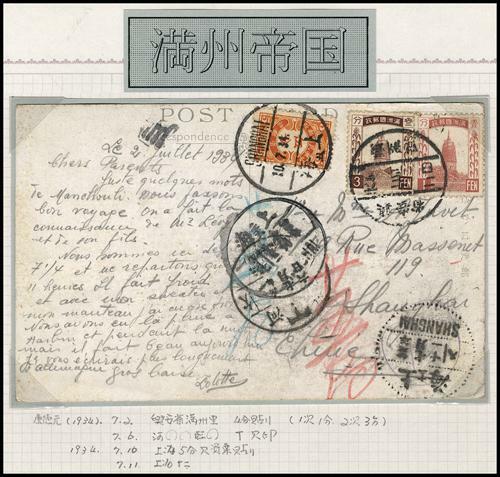 1903 (May) cover from Harbin registered to USA, franked on reverse CIP 10c pair, tied by scarce Harbin PO tombstone cancel and bilingual registered cachet, along with Newchwang, Shanghai Chinese PO transits, Seattle registered cachet and Milwaukee arrival. On front with Shanghai French PO transit. VF-F. Ex.Mizuhara. 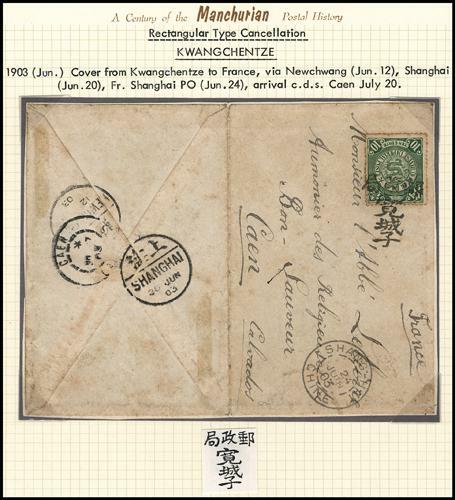 1903 (Jun) cover from Kwanchengtze to France, f.w. 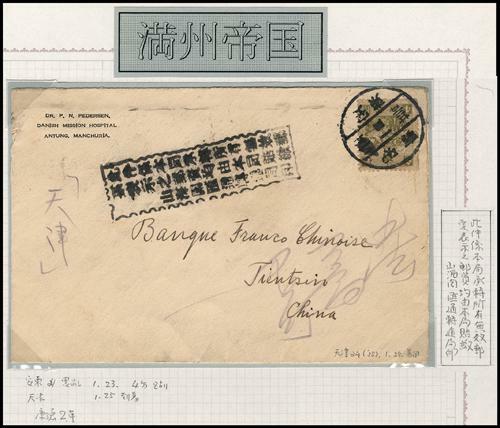 reverse CIP 10c, tied by rare unframed Kwanchengtze PO cancel, along with Shanghai French PO transit, on reverse showing Newchwang, Shanghai Chinese PO transits and France arrival. VF-F. Ex.Mizuhara. 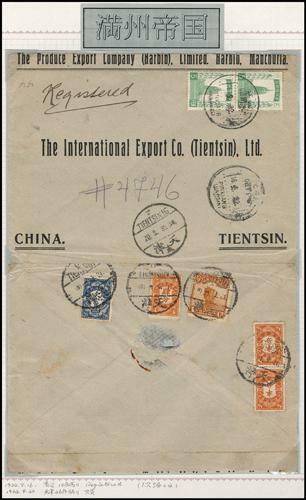 1911 cover from Yingkow to Fengtien, f.w. 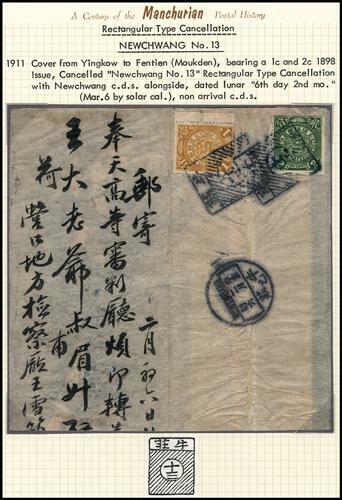 CIP 1c & 2c, tied by scarce Newchwang No.13 tombstone cancels, along with Newchwang Lunar Year cds. VF-F. Ex.Mizuhara. 1927 Peking 2nd Print Junk ovpt. For Use in Ki-Hei complete mint and used sets (Chan KH1-20), plus some used stamps in multiples. Hinged on album pages. VF-F.
1928 Inauguration of Marshal Comm. Issue Ovpt. "For Use in Ki-Hei" set in blocks of 6 with imprint top margins (Chan KH21-24), fresh MH/MNH with pristine original gum. VF. 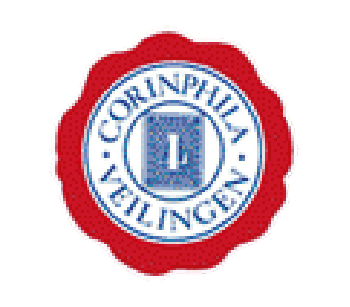 1929 Unification Comm. Issue Ovpt. "For Use in Ki-Hei" set in blocks of 4 with corner margins (Chan KH25-28), fresh MH with pristine original gum. Very Fine. 1929 State Burial Comm. Issue Ovpt. "For Use in Ki-Hei" set in blocks of 4 with corner margins (Chan KH29-32), fresh MH with pristine original gum. Very Fine. 1929-32 a group of 4 covers f.w. Junk ovpt. 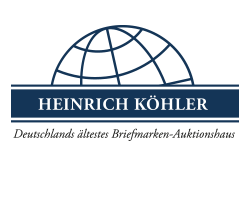 Limited For Use in Kihei issues, sent to Germany, France, Austria and Palestine. VF-F.
1927 Harbin to Germany registered cover and to England cover, both f.w. Junk ovpt. 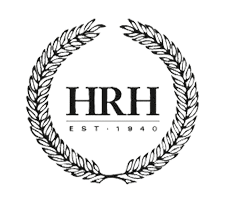 Limited For Use in Kihei issues. Later one mixed franking with non-overprint Junk issue. VF-F.
1929 (Feb 28) Manchuria to USA TPO cover, franked on reverse Junk ovpt. Limited For Use in Kihei 1c x 2 & 4c x 2, tied by clear Manchuli-Suifenho Train Office cds. Very Fine. 1932 (May 14) Heilungkiang Tsitsihaer to Switzerland, mixed franking on reverse Junk Issue 6c & Junk ovpt. 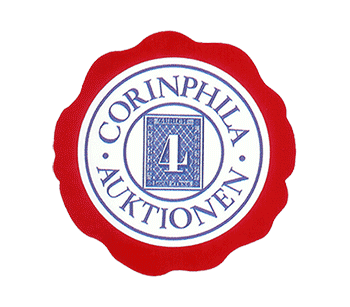 Limited For Use in Kihei 1/2c x 2, 1c x 2 & 4c x 4, tied by Lungkiang Tsitsihaer cds., along with Immensee arrival. Rare usage of Junk issues after establishemnt of Manchukuo. VF-F.
1929 (Aug 9) Harbin to France cover, f.w. Kihei Use commemorative issues, plus some used commemorative stamps. 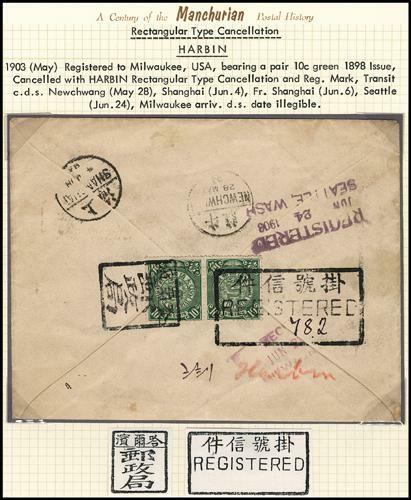 VF-F.
1933 (Sep 16) Manchukuo Harbin to Tientsin registered cover, f.w. 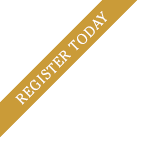 Manchukuo 1st issues 5f pair, tied by Harbin cds. 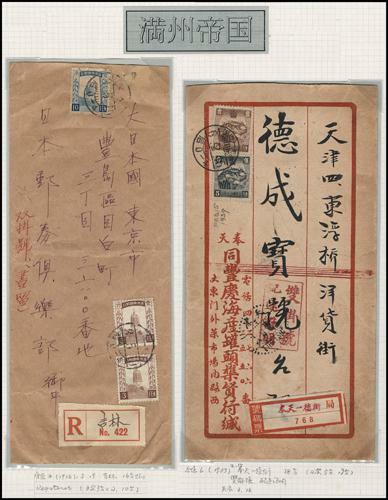 Due to not recognizing Manchukuo and its stamps, ROC Post postage due stamps x 4 mixed franking with Junk Issue 1c on reverse, tied by Tientsin cds. 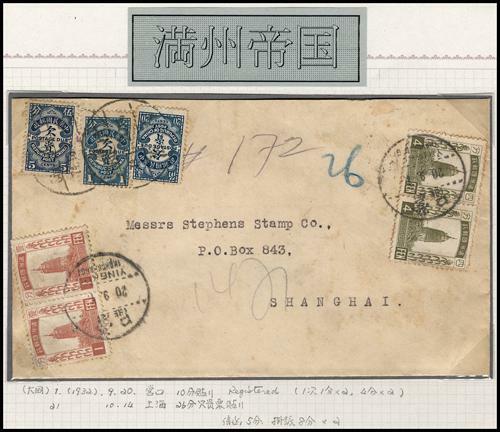 VF-F.
1932 (Sep 19) Mukden to Shanghai registered cover, f.w. 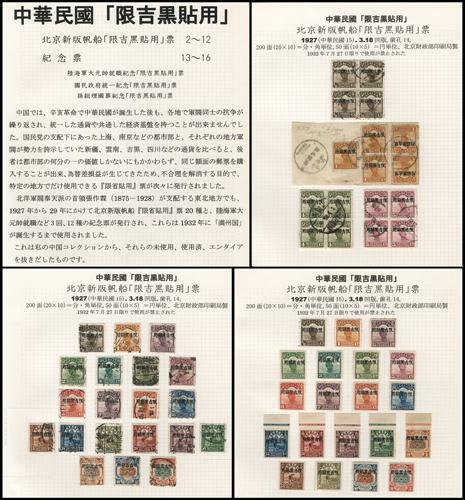 Manchukuo 1st issues x 8, tied by Mukden commemorative cds. Due to not recognizing Manchukuo and its stamps, ROC Post postage due stamps x 3 affixed alongside, tied by Shanghai cds. 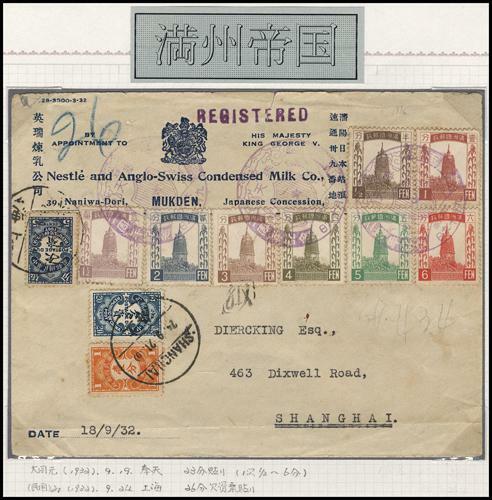 VF-F.
1932 (Sep 20) Yingkow to Shanghai registered cover, f.w. 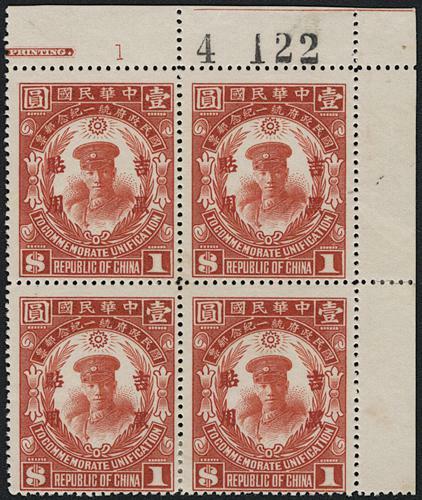 Manchukuo 1st issues x 4, tied by Yingkow (Newchwang) cds. Due to not recognizing Manchukuo and its stamps, ROC Post postage due stamps x 3 affixed alongside, tied by Shanghai cds. VF-F.
1933 (Sep 23) Harbin to USA registered cover, f.w. Manchukuo 1st issues 50c, tied by Harbin cds. Nice 50c single franking cover. VF-F.
1932 (Oct 21) Harbin to USA registered cover, f.w. 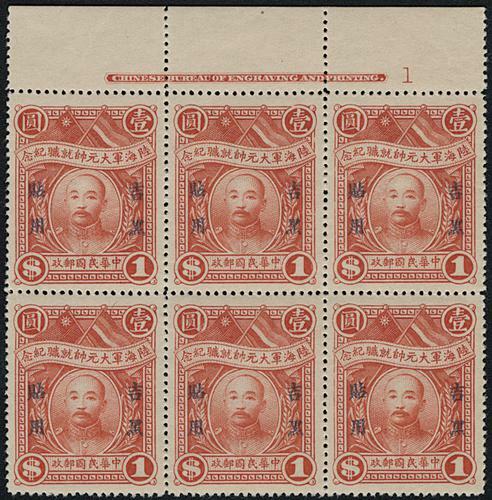 Manchukuo 1st issues x 7, tied by Harbin cds. USA transits and arrival on reverse. 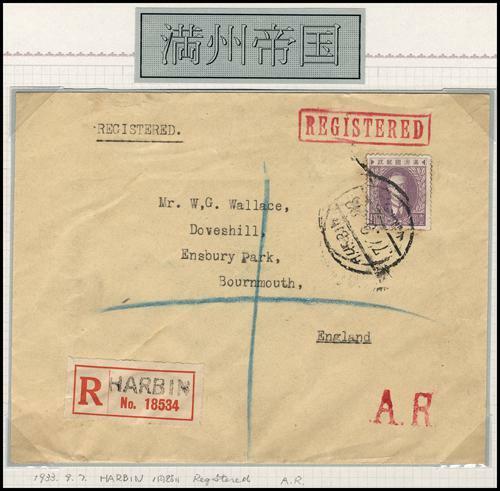 VF-F.
1933 (Sep 7) Harbin to England double registered AR cover, f.w. 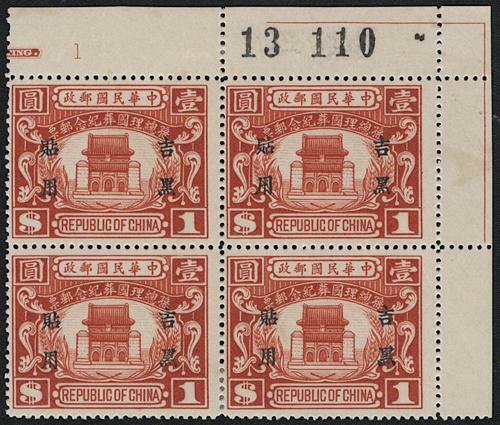 Manchukuo 1st issues $1, tied by Harbin cds. Rare $1 single franking used on cover. 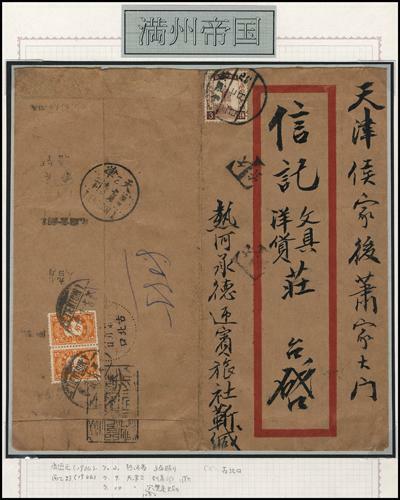 VF-F.
1934 (Jul 2) Manchukuo Jehol Chengte to Tientsin cover, f.w. Manchukuo 2nd issues 3f, tied by Jehol Chengte cds. 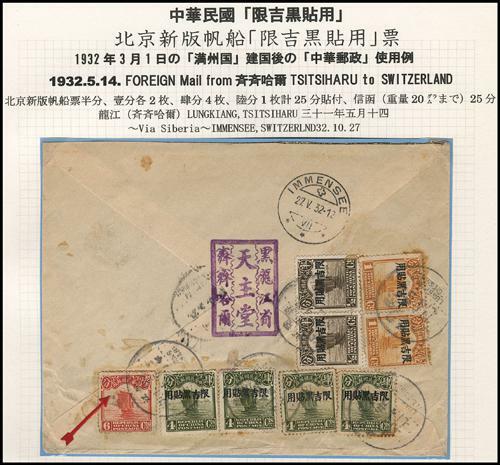 Due to not recognizing Manchukuo and its stamps, ROC Post postage due stamps x 3 affixed on reverse, tied by Tientsin cds., along with Kubehkow transit and Tientsin arrival. 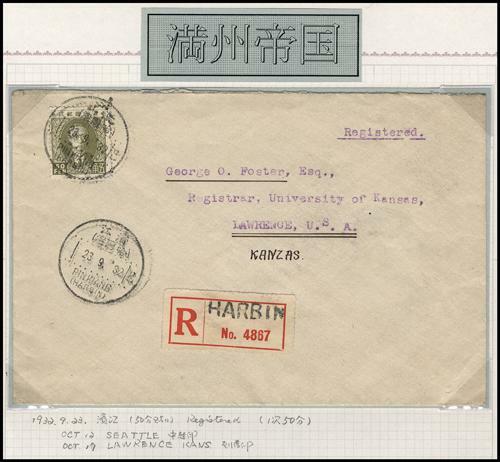 VF-F.
1934 (Mar 1) Kirin Chuho On Postal Service cover to Ministry of Communications, stampless, bearing on reverse two same Kirin Chuho cds. VF-F.
1934 (Jul 2) Manchukuo Hingon Manchuli to Shanghai postcard, f.w. Manchukuo 2nd issues 1f & 3f, tied by Hingon Manchuli cds. 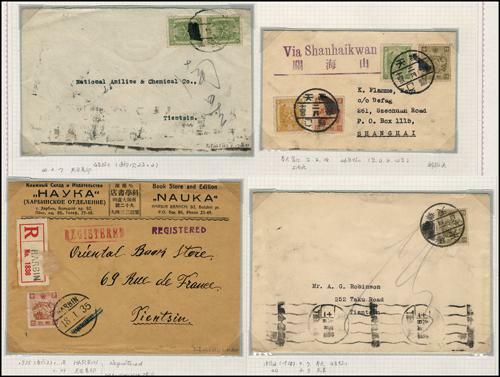 Due to not recognizing Manchukuo and its stamps, ROC Post postage due stamps x 3 affixed on reverse, tied by Shanghai cds., along with rare Hopeh Shanhaikwan (Linyu) Postage Due mark and Shanghai arrival. 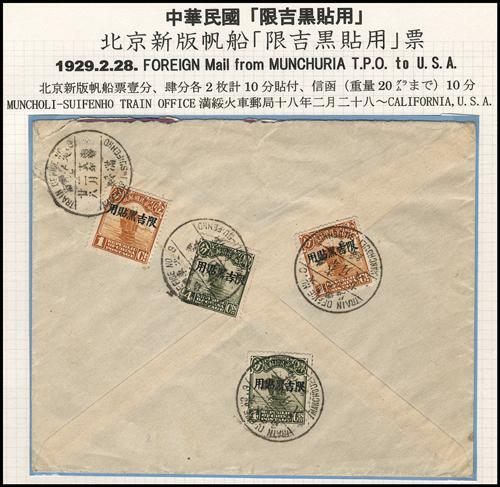 VF-F.
1935 a group of 4 Manchukuo to Tientsin or Shanghai covers, all postmarks smeared by ROC Post at the country's name "Manchukuo" and the Emperor Years. A nice lot. VF-F.
1935 (Jan 23) Autung to Tientsin cover, f.w. Manchukuo 4f stamp, tied by Antung cds., along with Shanhaikwan indicative cachet. Rare. F-VF. 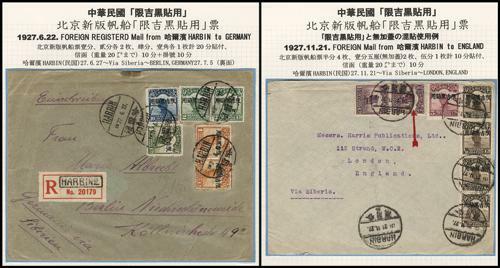 1936 & 39 Kirin to Japan double registered cover and Moukden to Tientsin double registered cover, rate 16f & 18f respectively. 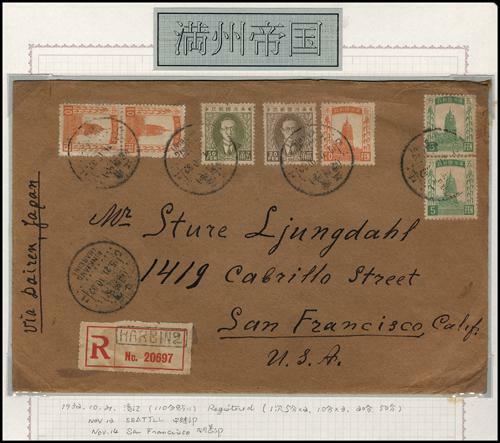 VF-F.
1937 (May 1) Mukden to Shanghai cover, f.w. Manchukuo stamps (stamps off), canceled by machinery postmark, along with Shanhaikwan indicative cachet. Rare. F-VF.